Last week was a bad week. In addition to everything else going wrong, my dryer broke. And with my ankle not so hot, this was a much bigger problem. The one thing I wanted for my birthday last year was a clothes line. D did get it for me so while I've been on the mend, the kids have been hanging out the laundry. I have been loving the smell of the clothes coming in off the line. It smells so fresh and clean. Today, I told D I wasn't in any hurry to get the dryer fixed. Sometime before September. The kids are afraid of stiff undies. Probably reasons many people are afraid to throw caution to the wind along with the clothes. There are ways around these problems. . .
That's where my dryer without the heating element comes in handy. Those stiff items will loosen up if you toss them in the dryer on an air only cycle. Another option is adding vinegar to the rinse cycle. Running them through the dryer with no heat will also remove excess lint and pet hair. When hanging pants, pretend like you're hanging them on a hanger...make the crease preserving fold then pin the hem or cuff to the line with the waist at the bottom. You know what else to hang upside down? Your shirts. I know...it seems like you should hang them from the shoulders, but it's better for the shirts this way. Use three pins for button up shirts. Overlap the button area and pin that first, then one pin on each side. Socks can be a problem. Heck, they are a problem when I have a working dryer. With the clothes line, you can kill two birds with one stone: Match the socks and hang them together with a single clothes pin. One great benefit I've discovered has to do with folding. I have a table next to my line I use for folding. As soon as the clothes are off, I fold them. I have to touch the clothes one at a time; it's not optional. It's so easy with the dryer to just pull everything out in a heap and fold later. So far I'm really loving the clothes on the line. It's warm enough here in the summer, I should be able to dry up to three loads a day! I love to pair up the socks when I hang them up. Then I fold them as I take them down. 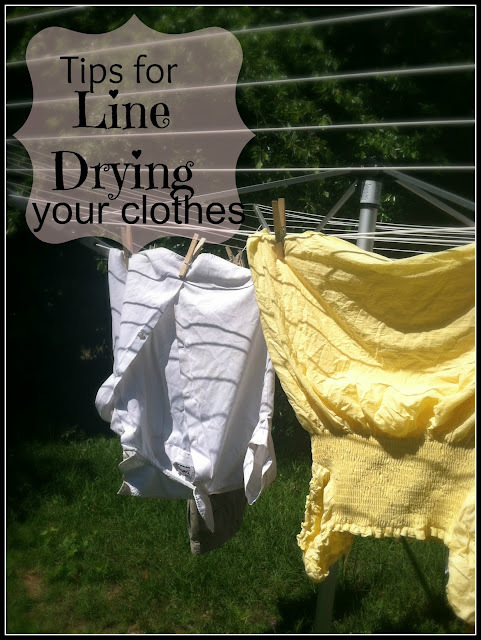 Awesome tips, I've been wondering how to prevent stiffness in line dried clothes. Thanks. Thanks! My dryer broke about two months ago, and I, too, told my hubby I could wait until colder weather to get it repaired. How much vinegar do you add during the rinse cycle? Do you pour it directly into the drum? My towels are the only thing that really bother me, and I've used fabric softener on them, but it hasn't really helped. Hopefully vinegar will! I love the idea of using a clothes line. Maybe I'll get one sooner rather than later. I am so jealous, I have been wanting a clothes line my entire adult life! I just love line dried clothes, and you can't get any greener then that. I am going to go bug my husband (again) about getting one, this is so inspiring! My dryer broke a year and a half ago and I'm in no hurry to get a new one. I love hanging laundry out and it does smell so good. In a bind, like during some of the rainy weeks, I take my laundry to my friend's dryer. I won't go to a landromat. To keep the clothes on the line from getting crispy, I go out and shake them around now and then while they are drying. I only have a short clothes line and the rest gets draped over patio furniture. Ah well, it works, esp. in the hot Florida sun. Great post. That's awesome. My dryer went out about 6 months ago. Luckily, my parents bought and put up a couple of T-posts for me for my Christmas present So I have a great laundry line. I love my fresh outside-dried clothes. Especially towels!! Towels that get fabric softener used on them are less absorbent. The fabric softener inhibits absorption. I use vinegar in the towels especially just to get all the residue out from the laundry soap. Hey Micki - Before hanging your clothes on the line, run them for 5 minutes in the dryer (on fluff or air-dry) -- They will be soft every time!